Nicolas Monod teaches at the École polytechnique fédérale in Lausanne and leads the Ergodic and Geometric Group Theory group there. In May 2016 he was invited to give the Gauß lecture of the German Mathematical Society (DMV) at the Technical University in Dresden. 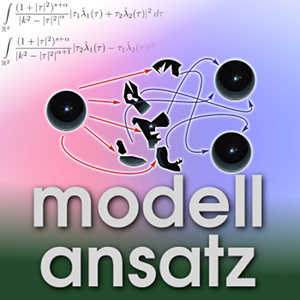 He presented 100 Jahre Zweisamkeit – The Banach-Tarski Paradox. The morning after his lecture we met to talk about paradoxes and hidden assumptions our mind makes in struggling with geometrical representations and measures. A very well-known game is Tangram. Here a square is divided into seven pieces (which all are polygons). These pieces can be rearranged by moving them around on the table, e.g.. The task for the player is to form given shapes using the seven pieces – like a cat etc.. Of course the Tangram cat looks more like a flat Origami-cat. But we could take the Tangram idea and use thousands or millions of little pieces to build a much more realistic cat with them – as with pixels on a screen. In three dimensions one can play a similar game with pieces of a cube. This could lead to a LEGO-like three-dimensional cat for example. In this traditional Tangram game, there is no fundamental difference between the versions in dimension two and three. But in 1914 it was shown that given a three-dimensional ball, there exists a decomposition of this ball into a finite number of subsets, which can then be rearranged to yield two identical copies of the original ball. This sounds like a magical trick – or more scientifically said – like a paradoxical situation. It is now known under the name Banach-Tarski paradox. In his lecture, Nicolas Monod dealt with the question: Why are we so surprised about this result and think of it as paradoxical? One reason is the fact that we think to know deeply what we understand as volume and expect it to be preserved under rearrangements (like in the Tangram game, e.g. ).Then the impact of the Banach-Tarski paradox is similar for our understanding of volume to the shift in understanding the relation between time and space through Einstein's relativity theory (which is from about the same time). In short the answer is: In our every day concept of volume we trust in too many good properties of it. It was Felix Hausdorff who looked at the axioms which should be valid for any measure (such as volume). It should be independent of the point in space where we measure (or the coordinate system) and if we divide objects, it should add up properly. In our understanding there is a third hidden property: The concept "volume" must make sense for every subset of space we choose to measure. Unfortunately, it is a big problem to assign a volume to any given object and Hausdorff showed that all three properties cannot all be true at the same time in three space dimensions. Couriously, they can be satisfied in two dimensions but not in three. Of course, we would like to understand why there is such a big difference between two and three space dimensions, that the naive concept of volume breaks down by going over to the third dimension. To see that let us consider motions. Any motion can be decomposed into translations (i.e. gliding) and rotations around an arbitrarily chosen common center. In two dimensions the order in which one performs several rotations around the same center does not matter since one can freely interchange all rotations and obtains the same result. In three dimensions this is not possible – in general the outcomes after interchanging the order of several rotations will be different. This break of the symmetry ruins the good properties of the naive concept of volume. Serious consequences of the Banach-Tarski paradox are not that obvious. Noone really duplicated a ball in real life. But measure theory is the basis of the whole probability theory and its countless applications. There, we have to understand several counter-intuitive concepts to have the right understanding of probabilities and risk. More anecdotally, an idea of Bruno Augenstein is that in particle physics certain transformations are reminiscent of the Banach-Tarski phenomenon. Nicolas Monod really enjoys the beauty and the liberty of mathematics. One does not have to believe anything without a proof. In his opinion, mathematics is the language of natural sciences and he considers himself as a linguist of this language. This means in particular to have a closer look at our thought processes in order to investigate both the richness and the limitations of our models of the universe. F. Hausdorff: Bemerkung über den Inhalt von Punktmengen. Math. Ann. 75 (3), 428–433, 1914. S. Banach and A.Tarski: Sur la décomposition des ensembles de points en parties respectivement congruentes, Fundamenta Mathematicae 6, 244–277, 1924. J. von Neumann: Zur allgemeinen Theorie des Maßes Fundamenta Mathematicae 13, 73–116, 1929. S. Wagon: The Banach–Tarski Paradox. Cambridge University Press, 1994. B.W. Augenstein: Links Between Physics and Set Theory, Chaos, Solitons and Fractals, 7 (11), 1761–1798, 1996. N. Monod: Groups of piecewise projective homeomorphisms, PNAS 110 (12), 4524-4527, 2013.